Quick project suitable for disabled populations. Quick project suitable for very disabled populations. 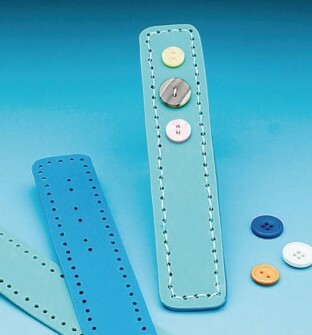 Sewing 3 buttons onto prepunched holes is followed by assembling front and back pieces with a running stitch. Includes prepunched foam bookmarks in assorted colors, waxed thread, assorted buttons and 6 large-eye metal needles. Pack of 12. Level 3.6-4.6.